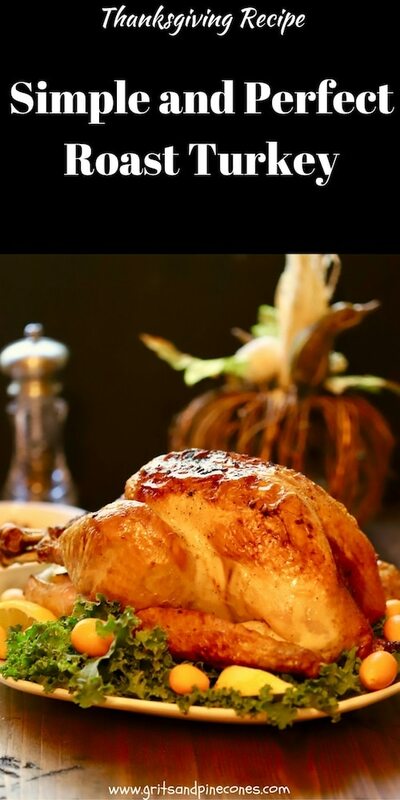 May I introduce you to Thanksgiving’s superstar, the Simple and Perfect Roast Turkey! I’ve gone “old school” this year and back to the basics to bring you a simple and classic roast turkey recipe. It’s the stuff of Thanksgiving dreams and probably resembles the moist and delicious turkey you remember from your childhood. A quick search on the internet for turkey recipes results in literally thousands of different recipes. And, as you might imagine, they include oven-cooked turkey, deep-fried turkey, spatchcocked turkey, brined turkey, smoked turkey, and they are covered with all sorts of different rubs and glazes. 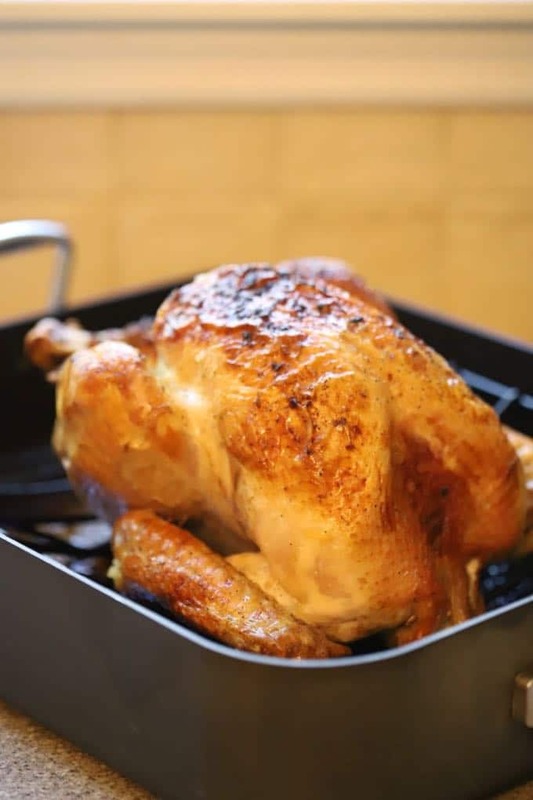 But this recipe for Simple and Perfect Roast Turkey is as easy and as basic as you can get and whether this will be your first attempt at cooking a turkey or you are a seasoned pro, I think you will love the pure simplicity of this recipe. How long does it take to cook a turkey? 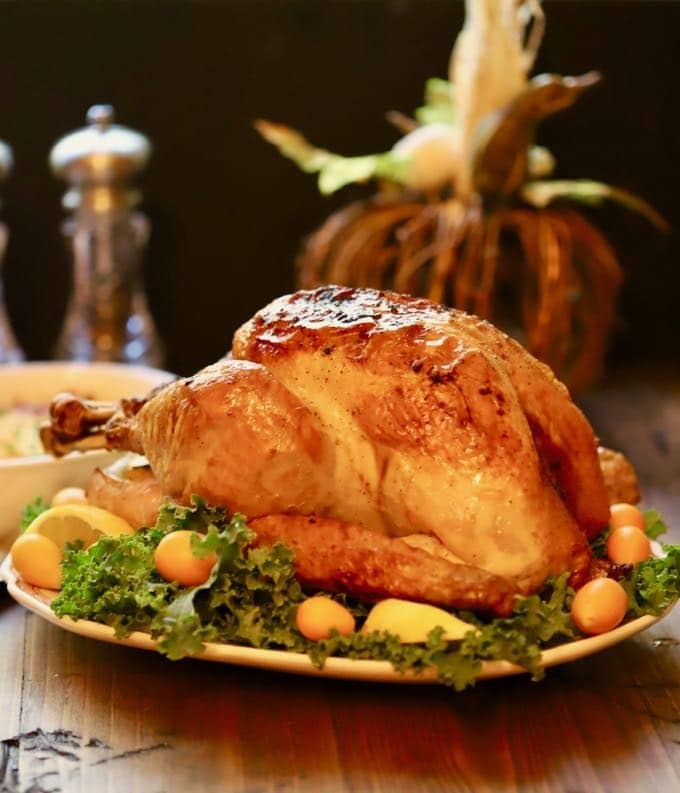 Well, of course, it depends on the size of the bird and your oven temperature, but generally, it takes approximately 15 minutes per pound at 350 degrees to cook a turkey that is fully thawed. For example, my turkey was 11 pounds, and it ended up taking about 2 hours and 30 minutes to cook. If you have a convection oven, generally it takes about 9 minutes per pound, but you will want to refer to your oven’s instructions. Does my turkey need to rest? Yes! For maximum flavor and juiciness, your turkey should rest covered loosely with foil for at least 20-30 minutes before you carve it. If you have a large turkey, it should rest a while longer. While resting, the internal temperature of the meat will also rise by 5-10 degrees. Do I need a meat thermometer to tell if my turkey is done? Yes, a thousand times yes! 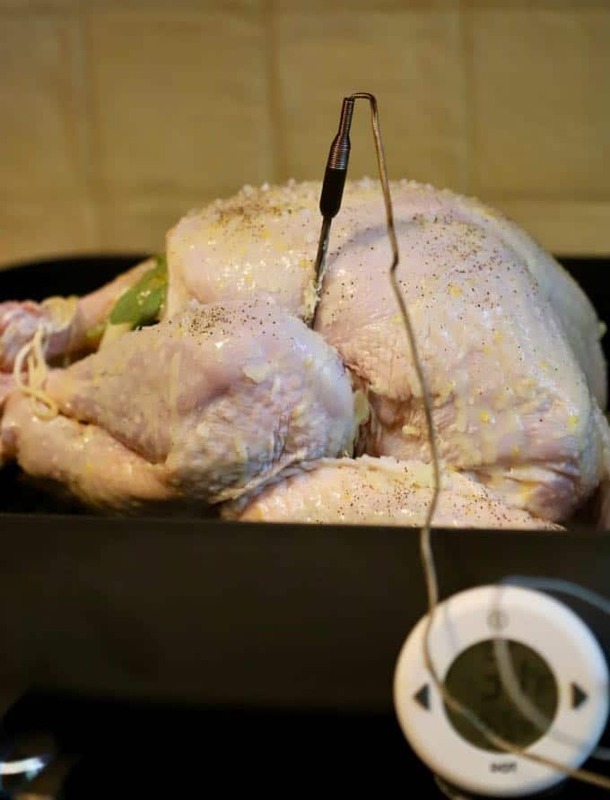 A good meat thermometer will pay for itself and guarantee that your turkey or any other meat that you might be preparing is cooked perfectly. I use a DOT digital thermometer which I dearly love. It has a probe that is inserted into the meat and when the temperature I set is reached, it beeps to let me know it’s done. No guesswork involved. I bought mine at Brown’s Kitchen Supply in Tallahassee, but I’m sure they are also available wherever kitchen supplies are sold. I have tried numerous other kinds of manual and digital thermometers, and the DOT is by far my favorite. How do I know when my turkey is done? The best way to know when your turkey is done is by its internal temperature. The USDA says a turkey is safe when “cooked to a minimum internal temperature of 165°F as measured with a food thermometer.” Check the internal temperature in the innermost part of the thigh and keep in mind that the temperature will increase slightly when the turkey rests. PS: Don’t ever rely on the pop-up thermometers that come with some turkeys. 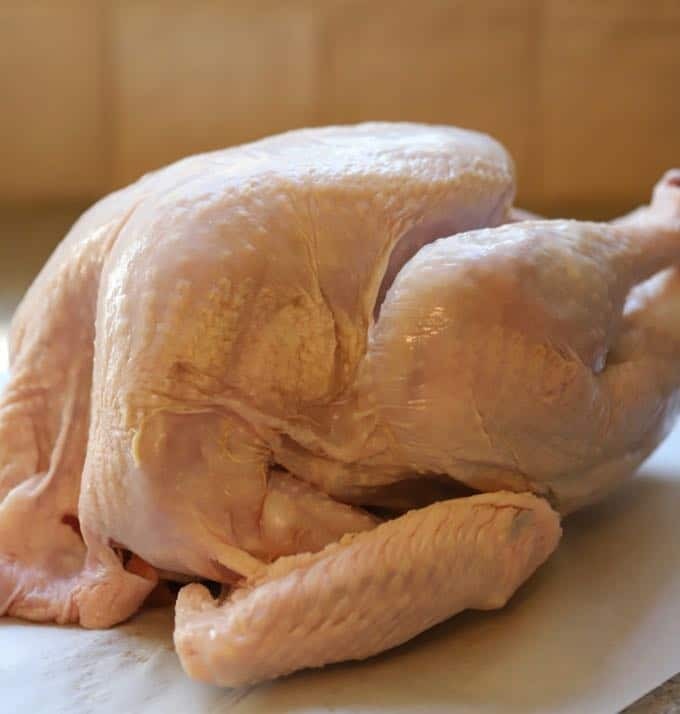 How big a turkey should I buy? 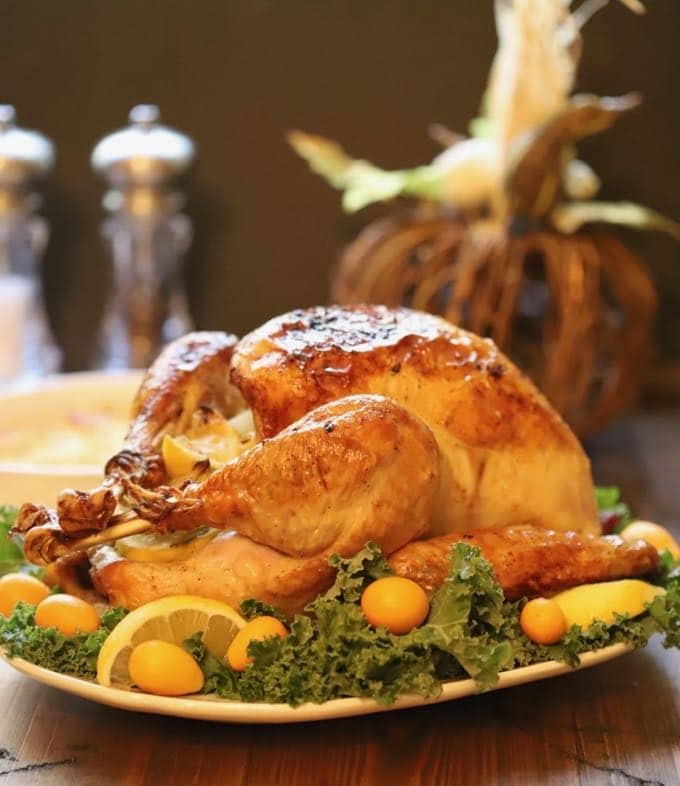 The rule of thumb is about 1-1/2 pounds of turkey for each adult you will be serving. If you want leftovers, you might want to increase that a bit. If you are feeding eight adults, a 12-14 pound turkey should be about right. To brine or not to brine? It’s completely up to you! 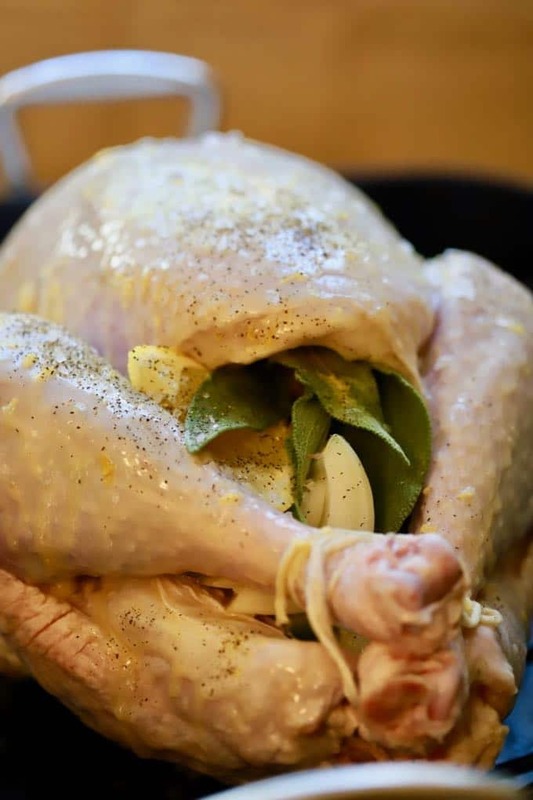 Brining enthusiasts claim that the turkey absorbs extra moisture during the brining process, which in turn helps it stay more moist and juicy. But wet brining is a messy business and I prefer to dry brine mine, which is simply covering the surface of the turkey with salt and in some cases salt combined with a little baking powder, and then letting it sit in the refrigerator uncovered for 24 hours before cooking. I dry brined my smoked turkey last year but decided to skip this step this year, and both turkeys were moist and delicious. Remove the giblets and neck from the turkey and rinse the turkey inside and out. Pat dry with paper towels. Melt butter in a small saucepan. Remove from the heat and add the lemon juice, lemon zest, and poultry seasoning. Place the turkey on a rack in a large roasting pan. Liberally salt both the inside and outside and sprinkle with pepper. Optional: If you are stuffing the turkey, place the apple, lemon, onion, and sage leaves in the cavity. Use kitchen string to tie the legs together and tuck the wing tips under the body of the turkey to keep them from burning. Brush the melted butter mixture all over the turkey. Place the turkey in the oven uncovered and continue basting with the butter mixture about every 30 minutes. Cook the turkey until your food thermometer registers 165 degrees F. in the innermost part of the thigh, which should take approximately 2-3 hours. When the turkey is done, remove from the oven, tent loosely with foil and let it rest 20-30 minutes before carving. If you liked the recipe above, please consider rating it and leaving a comment below. Also, follow me on Pinterest, Facebook, and Instagram. And finally, to be the first to receive new notifications of new posts by email, enter your email address in the Subscribe box. Thank you so much for visiting Grits and Pinecones! *This recipe shared with Julia’s Simply Southern for Meal Plan Monday’s Thanksgiving Recipes Post! It's back to basics with an easy and classic Simple and Perfect Roast Turkey Recipe. It's moist and delicious and the stuff Thanksgiving dreams are made of. Looks great Beautiful turkey. What is the brand of the food thermometer used in this post? Thanks. I use a DOT meat thermometer which I love! You put it in the meat, set the temperature you want and it beeps when it is done. Thanks for the info. I ordered one today.